This entry was posted in China, CRP4, Disease Control, Egypt, Emerging Diseases, Europe, Germany, ILRI, Interview, MarketOpps, Middle East, Opinion Piece, PA, Poultry, Spotlight, UK, Zoonotic Diseases and tagged Bird flu, corona virus, Delia Grace, Matthew Davis by Susan MacMillan. Bookmark the permalink. GENEVA, April 21 (Reuters) – Two more people have died from a new strain of avian influenza, bringing to 20 the number of deaths from the H7N9 virus, the World Health Organization (WHO) said on Sunday. Chinese authorities have notified the WHO of six new cases, bringing the total to 102. Of those, 70 are still in hospital and 12 have been discharged. Five of the new cases were in Zhejiang province and one was in Shanghai. “Until the source of infection has been identified, it is expected that there will be further cases of human infection with the virus in China,” the WHO said In a statement. 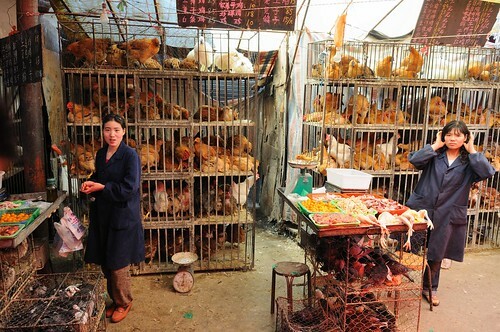 The WHO’s China representative, Michael O’Leary, issued data on Friday showing that half of the patients analysed had had no known contact with poultry, the most obvious potential source, but he said it appeared human-to-human transmission was rare.